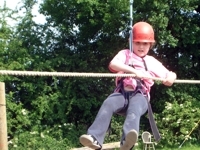 In June of 2007, Challenge Cancer Through Adventure organised and funded an activity day for young achievers, at Duke’s Barn Activity Centre in Derbyshire. Pictured are Lucy, (top) who brought her parents and a friend along to share the fun. 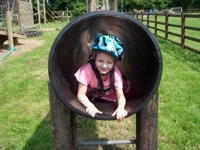 Lucy has cystic fibrosis, and is certainly not letting that get in the way of having a good time on the Ropes course. Ellis (below) brought her brother and her mum. Ellis has a kidney tumour and had a great day trying all the outdoor activities. The Activity Day was led by Graham Jones assisted by Caroline Brunt. The parents joined in and all had a great day on the new Duke’s Barn Ropes Course followed by a brilliant time abseiling off Millersdale Bridge.